interested and eligible candidates can apply for Anganwadi jobs through online mode and online application forms will start from date 20-12-2018. 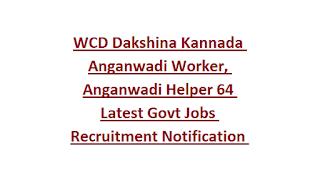 The online official website of WCD Dakshina Kannada for applying Anganwadi Helper and Anganwadi Worker jobs is www.anganwadirecruit.kar.nic.in. The closing date for online fee payment and apply for the online application forms is 15-01-2019. The candidates will be shortlisted based on their performance in written test and interview. For the more details of age limit, pay scale, available vacancies and how to apply are given below for Anganwadi Worker, Anganwadi Helper jobs in WCD Dakshina Kannada recruitment notification 2018. The post name and available vacancies are given below for the Anganwadi Helper and Anganwadi Worker jobs in WCD Dakshina Kannada 2018. The age relaxation will be applicable as per the government norms. Salary offered for the selected candidates for Anganwadi Worker jobs is Rs.7000/-. Last date to pay the application fee through online is 24-10-2018. Candidates belongs to General/OBC category the application fee is Rs.200/-. And the candidates belongs to SC/ST/PWD/Ex-s category the application fee is Rs.100/-. The candidates will be shortlisted/selected based on their performance in written test and interview conducted by State Government. Temporary merit list will be displayed on 00-00-2018. Document verification for temporary merit list candidates dates is 00-00-2018 to 00-00-2018. Final merit list will be displayed on 00-00-2018. 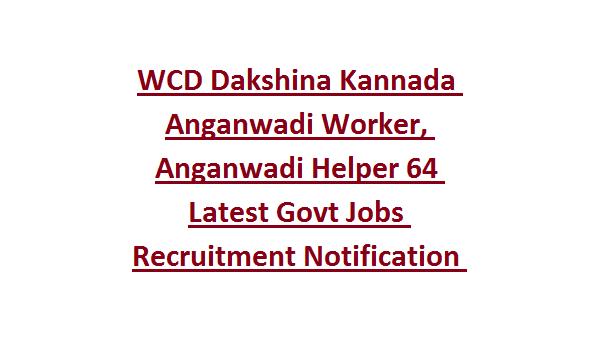 Interested candidates can apply for Anganwadi jobs through online official website of WCD Dakshina Kannada is http://www.anganwadirecruit.kar.nic.in/ and submit the application form before closing date 15-01-2019. Candidates can pay the application fee through online at the time of form submission and more details of how to apply online candidates can refer in the official website notification.